Are we really 15 years into Agile and still failing to master one of the foundational principles? That is to use data to provide frequent, actionable feedback loops. Most teams still rely on the most rudimentary of metrics… velocity and burndowns. We know we can only deal with the complexity of software development by using, ‘inspect and adapt’ cycles. We have collected lakes of data in every TFS, Jira and Rally instance and yet most of it remains as clear and useful as a stagnant pond. Metrics are tainted by years of association with ‘governance’ and of being used to feed the ‘process Gods’. The idea that the individuals within teams might actually benefit from this insight seems to have been overlooked. SenseAdapt is a collection of simple visualisations that enable teams and stakeholders to sense what is going on in their system and adapt it, in order to deliver more value. Our aim with SenseAdapt is to bring objectivity and help create a shared, common understanding of what is going on. The conscious and sub-conscious motivations of team members, project managers and stakeholders too often clouds the picture. The visuals are being used by three of our largest clients and continue to evolve rapidly with their feedback. Note: SenseAdapt continues to evolve. Please get in touch if you would like a demo or join our other clients in trying it on site. For the moment it is free – in exchange for your feedback. Used through the day, possibly in a dashboard, and draw attention to the parts of the system that need action. For example; PBIs (Product Backlog Items / user stories) that have got stuck or forgotten, the levels of WIP per person, the number of unestimated or PBIs that are too big. The visuals also provide useful input into the retrospectives. 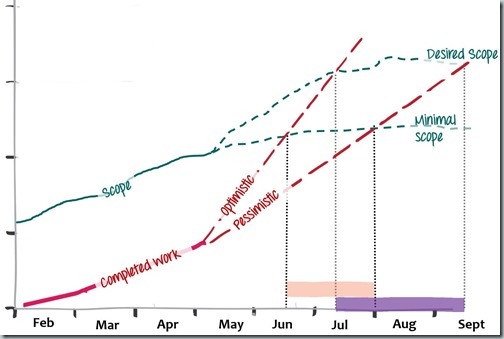 Shows the behaviour of the system over time, the bottlenecks, levels of WIP and lead times. Draws attention to the PBIs that need to be refined, sliced smaller or estimated. The chart shows the numbers of PBIs of each size, and their state. It clearly shows the unestimated stories as well. This is better than the commonly used sprint burndown, as it shows the rate that the team is actually completing stories – not just tasks. This example shows a typical anti-pattern of last minute closing of stories in a sprint. 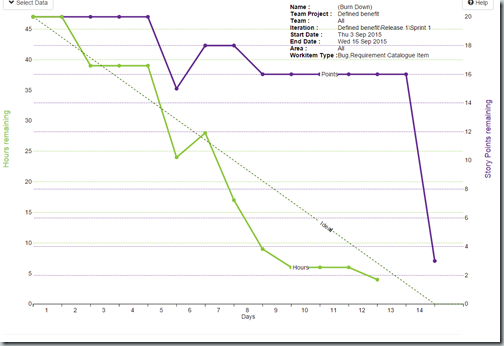 The story burndown, in points, is shown on the right hand scale, with task burndown on the left. Shows whether PBIs are in the correct Iteration Path or Area Path (when using TFS). 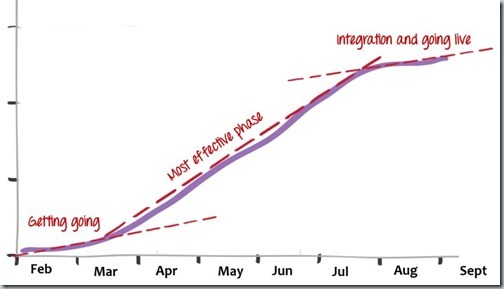 Most metrics are driven from the Iteration path, therefore PBIs in the wrong iteration can lead to a misleading picture and incorrect forecasts. Teams quite often come to overlook PBIs, which may stall in a particular state or just be forgotten, this particularly the case if there is a lot of WIP (Work in Progress). This chart draws their attention to PBIs that have not been amended for and need some attention. These charts help stakeholders understand where the project is and when or what options there are for intervention. 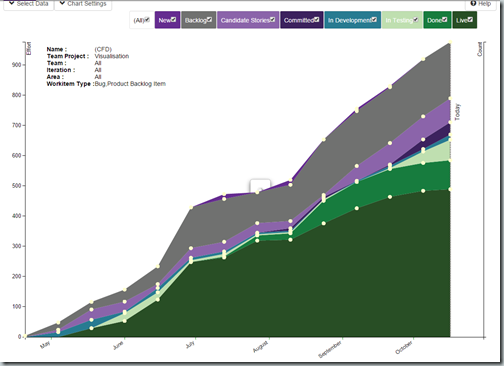 Live project data – one click away. 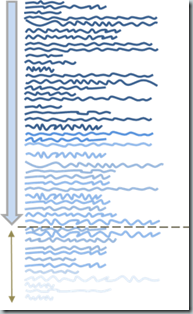 Each saved chart has its own URL that can be emailed or held in a project page or wiki. They help to keep stakeholder expectations realistic and aligned. Significantly more informative and transparent that opaque RAG updates, which hide as much as they reveal and remain largely subjective. 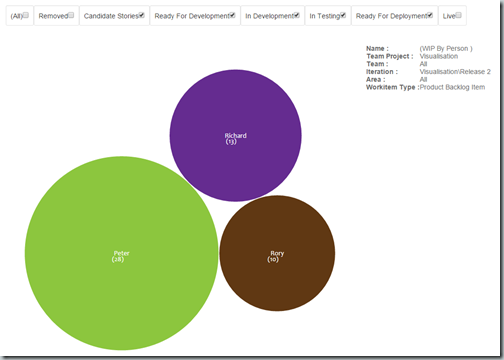 The burn-up clearly shows the range of likely delivery dates of a project. The example below is from a client with two teams totalling 20 people. The project is likely (we deal in probabilities) to land in the shaded green ‘landing zone’. 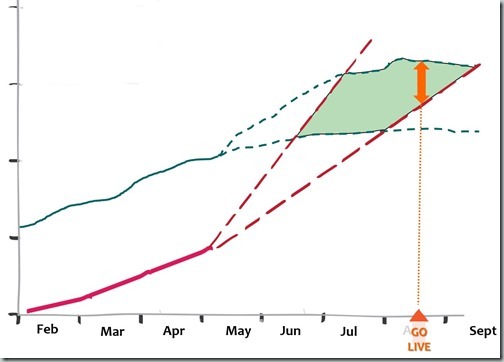 It’s clear, in this example, that one of the key risks to the delivery date is the rate of increase of the scope. This forecasting is based on standard deviations from the mean , which can be varied by the user, using more or less history in the calculation of the mean and choosing how many standard deviations for the forecast. In the near future we will use Monte Carlo (see below) simulation to model and forecast both the scope and the throughput rates. 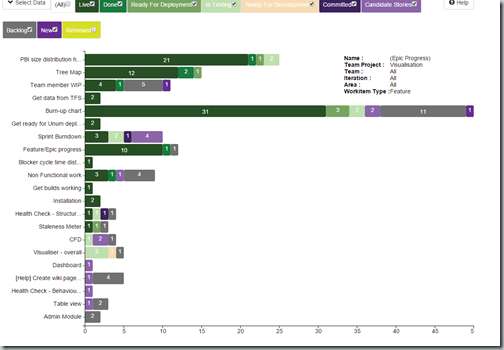 Shows the progress of PBIs within a feature. 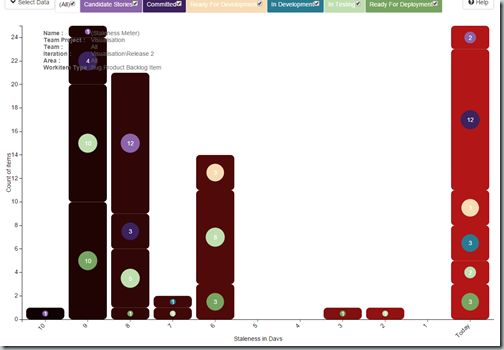 Business stakeholders can clearly see the relative size of features, as well as the progress. Shows the status and relative size of all features. Clicking on any feature will show the same for its child PBIs. Features and PBIs can be opened directly in TFS. 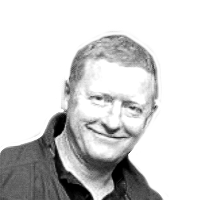 Thought leaders, like Troy Magennis, toil on the edge of our Agile consciousness, promoting ideas that we should all have embraced in a heartbeat – specifically that the data of how our systems have behaved to date is the best predictor of how our systems will behave in the future. His website and blog Focused Objective makes a very strong case for this approach. Then take the remainder of your backlog and run it through that model thousands of times, giving you a frequency distribution of the possible dates it could finish. Use that range of dates to engage stakeholders and start discussions about what could be done to land the project successfully. After 10,000 runs the output looks something like this. We will write more extensively about the use of simulation within SenseAdapt in later blogs. 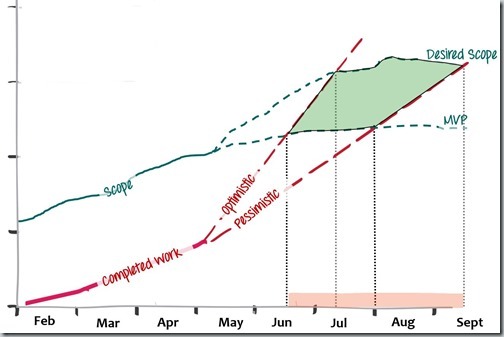 I’m embarrassed to admit that, as a long time Agile coach, I hadn’t appreciated the benefits of burn-up charts over burn-downs, merely seeing it as a mirror image - I was wrong. However it has brought me to this metaphor of landing the project in a zone where two joysticks, held by different stakeholders, guide in the project (or MVP or ‘next release’). The PO (business) holds the scope ‘joystick’ whilst the team adjusts the ‘throughput rate’. Being co-pilots in this joint endeavour helps foster collaboration between the two ‘sides’. i find that the most insight-generating metaphors are simple and incorporate a familiar aspect of our physical world. 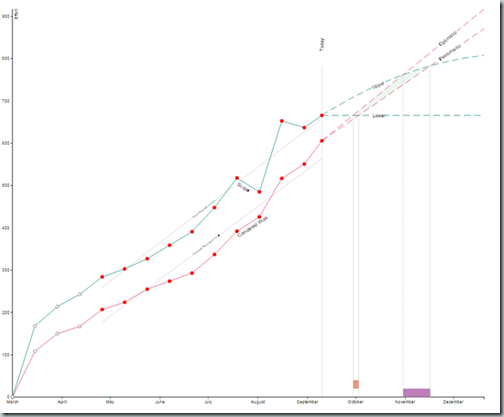 Our historical data of ‘completed work’ shows the rate of delivery (velocity). Which we can extrapolate into the future using pessimistic and optimistic rates. A vertical line down from where these cross the scope line, gives us a date range that this project will finish. In this case I’ve assumed the scope doesn’t change after today. The angle of those pessimistic and optimistic throughput rates is largely determined by the team and overall system effectiveness. Note: We currently use simple calculations to decide the angle, e.g. optimistic (median +25%) and pessimistic (median – 25%). Alternatively a moving weighted average works well too. 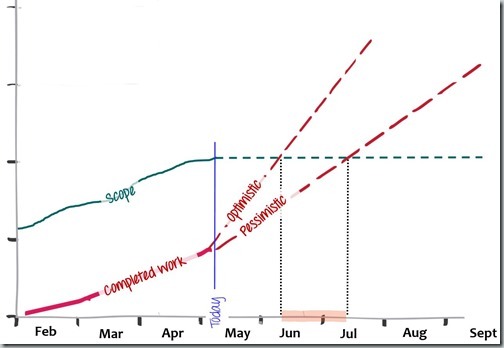 This shows there is often lowering of the throughput rate in the last 20% of a project – assuming that the definition of done was not quite perfect – which is common! The desired scope that was in the business plan and stakeholders thought was necessary when the project was first conceived. The minimal scope, or MVP, that would deliver value to users, generate learning and is a viable delivery. We need to develop better ways to model this change in scope, however we’ve all seen this in projects, even if the root causes vary. There are two possible date ranges within which this project will go live. It’s easier to visualise and to say, with a fair degree of confidence, that the project is going to land somewhere in this green zone. Representing the truth in this comprehensible, palatable way stimulates many more possible interventions, for the team and business, than a RAG status ever could!! To be confident that we can launch at that conference in mid-August, we can see what options we have to reduce scope to come within the pessimistic line. It’s also clear that we will at least have the MVP by the conference and possibly a little more. A client recently told me of some members of a development team saying how they couldn’t see the value of adopting Agile. It’s not uncommon to hear similar sentiments in many teams. This got me thinking about how we often externalise the indefinable in order to; understand it, sell it, master it and sometimes resist it. The common coaching attempt to reposition Scrum/Kanban as a ‘framework’ rather than a ‘process’ doesn’t come close to the visceral resistance (fear) we feel to something ‘other’, that is outside of us. The real challenge is not one of semantic classification, but of human self-identification and engagement. In essence this is about our ‘way-of-working’, something we are fully immersed in. Like being in water, we can’t push against it. This is what we do, hour-to-hour – it’s not external to us… it is us. And that’s the quasi-Zen bit**. That Kanban board over there is merely a reflection of the way we currently work – it’s not ‘a process’. If it’s not an accurate representation – let’s improve it. When it comes to Agile principles there is no external 'process' unless you choose to define one. Scrum, Kanban or XP are merely instantiations of those principles – they bring those principles to life. We need to find a way for people to see beyond their own work and to the results of their collective efforts with others. After all, the ultimate purpose in our work is in delivering value to users – and that usually requires other people. I’m keen on ‘optimising the whole’ and ‘Systems Thinking’, however that too is a form of externalisation and should be introduced carefully. Whilst keeping it safe to learn and recognising those that share their learnings. This probably comes across as a negative perspective – and yet, I think it evokes a particularly powerful emotion in us – because it’s based on actual feelings. A more ‘positive’ perspective like, “deliver more value” arises from abstraction that doesn’t resonate as deeply or evoke emotion in me. As an individual I can’t influence (on my own) the behaviour of that system – and so, whilst I might recognise it as a laudable goal, it doesn’t impel me to action – at least in the early stages. Whilst there is positive emotion associated with recognition of a job well done or in the sense of completion when one puts something in the ‘Done’ column, I think the ‘negative’ is more likely to stop us tolerating the status quo. Apologies if by the end of this you saw it as a thinly veiled attempt to blog a catchy title (See Zen And the Art of Motorcycle Maintenance http://en.wikipedia.org/wiki/Zen_and_the_Art_of_Motorcycle_Maintenance ) However, there is something illusive about this topic which requires a certain contemplative mind-set, which is another aspect to that I was trying to convey. Portfolio-level prioritising is fraught with problems… ambitious senior stakeholders, promoting their agenda, rarely meeting together to see how their projects compare to others resulting in a portfolio in continual flux – and not a little distrust. Such vague, contradictory, fluid priorities at the top trickle down through the whole organisation… generating waste as they go…. 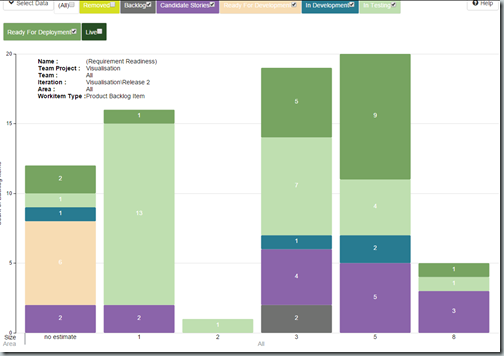 Getting a stable, visible and well prioritised portfolio backlog is a key step towards successful Agile adoption. Prioritising by ROI or a strict financial measure does not work – even though we wish it did and keep trying to make it so – an army of commercial accountants couldn’t set enough rules and then get everyone to play by them. The real challenge is not whether to do a project – but which one to do next. i.e. this is about prioritising, not about getting a business case signed off. Every client I’ve worked with in the last seven years has had more than two years of projects with over 100% ROI in their backlog i.e. they would all pass the business case test. The other challenge is to keep the business focused on the most valuable projects – and minimising Work In Progress (WIP). The easiest way to keep insistent stakeholders at bay is to at least START their project… spinning up more and more WIP as we do so. The value of an Epic (slice of project) or MMF (Minimal Marketable Feature) itself is not enough. Some valuable work is trivial to deliver, whilst another is costly – so our approach needs to quickly identify those with a high value:cost ratio – and get it moving through the system.. The value / cost ratio is the key– and we decide what constitutes value and cost – which means we can include some less tangible elements, like risk. We can also find a way to include ‘gut instinct’, which factors in our experience. The ranking needs to be simple, quick, objective (as possible) and transparent. The process encourages conversation and adds insight and understanding between stakeholders – this is not the wasteful process that some have suggested. This approach helps to ensure the conversation at least starts from the same place – i.e. with a common understanding of what we are trying to prioritise. No business should make a decision purely on such numbers – however, this weighting process at least allows for comparisons to be made. Both value and cost are made up of several elements, customised to the specifics of a company or programme. These are then weighted by the stakeholders, depending on importance , with weightings adding up to 100. Each element is given value of; 0,1,3,5 or 7, writing the text in the boxes is another valuable process for stakeholders to discuss and agree on. This element score is then multiplied by the weighting to give an overall value score for that Epic or MMF. 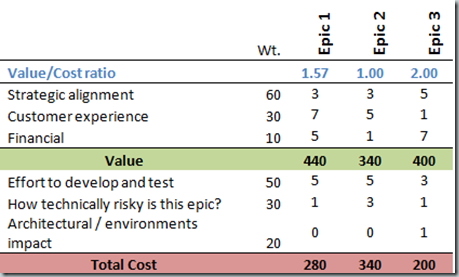 All the epics can be summarised in a table like this..
At a glance we can see that Epic 3 gives us a greater return than Epic 1 – even though 1 has an overall higher value. This data is easily presented and understood by senior stakeholders. It’s easy for one stakeholder to see what rankings have been given for an epic and to drill into the assumptions behind it and so we get discussion, trust building and a better decision. Asking why someone gave a 5 rather than a 3 quickly surfaces the underlying assumptions – and starts a valuable conversation. Stakeholders can then adjust the order for dependency, or other business reasons that may not be in the model. Likewise for cost, there is a now a way to factor in risk and architectural impact and dependency and not just effort. How much value have you delivered in the last quarter? It’s now possible to total up all the epics delivered and their accumulated value and follow the trends… It’s true we don’t have an absolute value – but the trend does tell us something useful.. Note : Typically we have used to prioritise the MMFs and ‘Epics’ (slices of project) whilst in principle it could be used finer-grained user stories, the process would probably need adapting. The simplest illustration of the benefits of focus must be this one – clearly illustrating that if we focus on _and finish_ one feature (or project) at a time then all 3 features are delivered quicker. Agile emphasises delivering value sooner – in order to generate revenue, create lessons and validate assumptions. In the ‘current situation’ all three features are started as soon as they are requested – but none are finished until near the end. However, many studies (e.g. in Tom DeMarco and Tim Lister’s book ‘PeopleWare’) show that there is a real cost in switching between tasks. Therefore, assuming a saving of only 10% – we see that all three features are delivered significantly sooner. This is not just a marginal gain, it could translate into weeks of additional sales. As well as the benefit of earlier value and lessons – don’t underestimate the energising effect on a team that delivering A, and knowing it’s in the hands of users, can bring. Focus increases the ‘realness’ of the work and sense of achievement and recognition that the team. Focus also means more collaboration within the team, which can only bring a better solution – creatively built from multiple perspectives. … the real challenge is how to adjust the behaviour that’s driven by this assumption, which often recurs at every level of the organisation. Many turn to contracts as a way to reduce risk. Agile has several alternative, and proven, was to reduce risk. 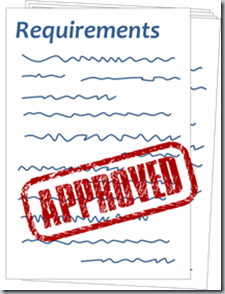 This blog outlines shows how to get from a contract to an ordered list of clear requirements and why that is a better way to define what functionality your customers would value – and then deliver it. The following recipe can take us from that contractual mind-set to a more palatable Agile one.. by reducing the bitterness of risk. … and flatten it out to see its many pages of requirements.. Step 2: Go through document identifying the specific requests for functionality and value. Shade the more important / valuable requirements in a darker shade. Step 3: Boil off the narrative – to be left with the essence of the requirements. Making it easier to read and comprehend. As independent elements in a list they are also easier to keep fresh – with minor clarifications, instead of having to reissue multiple versions of a document. Risk reduction: the requirements are more easily comprehended in this form – free of the padding narrative, and sometimes semi-deliberate obfuscation, in a document. 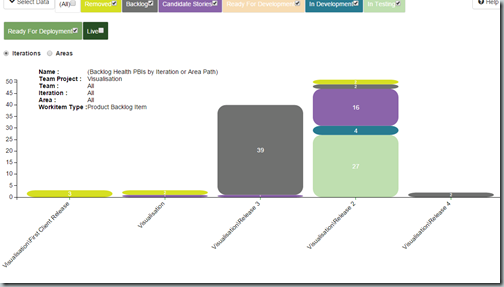 Stakeholders can get a better idea of what is being delivered – further helped if we use a visualisation technique like story mapping. Hence reducing the risk of misaligned expectations. Step 4: Further refine requirements for readability – by writing them in simple, non-technical English, from the perspective of a human user and understandable by everyone. – i.e. user stories. Risk reduction: The requirements are clearly prioritised, allowing stakeholders to see and question earlier decisions, thereby reducing the risk of abrupt changes of strategy and direction. Risk reduction: Developers work down the list from the top, making sure the most important functionality is delivered first. This is very different from when a developer team is given a document of unprioritised features, where they may choose to tackle the riskiest or most intriguing part first. Step 7: Start to deliver the most valuable stories first. Note we say ‘deliver’ not ‘build’ or ‘develop’ or ‘code’. Focus on the first shippable slice of functionality – and get it to your customers as fast as possible, to deliver value, learn from feedback and validate your assumptions. This is usually called an MMF (Minimal Marketable Feature) or (MVP) Minimal Viable Product – as advocated in ‘Lean Startup’. 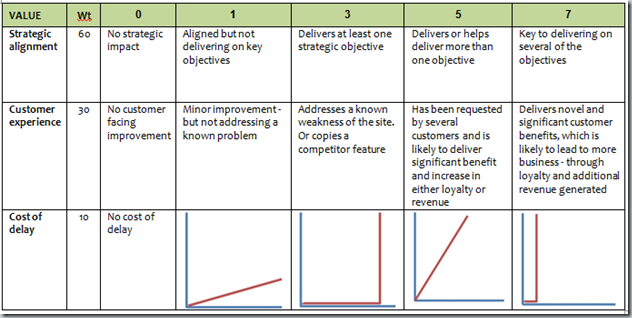 Step 8: Continue to slice the stories down to clarify and ensure you can deliver several (5-15) every iteration. 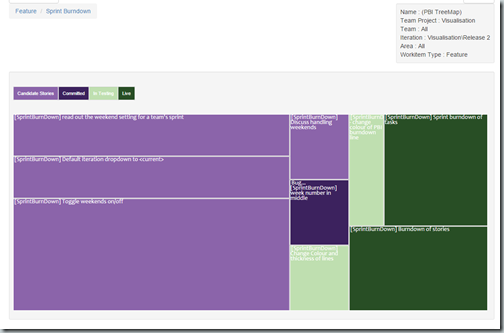 Step 9: Slice the stories vertically – so that a user can validate the work and give feedback to the team. 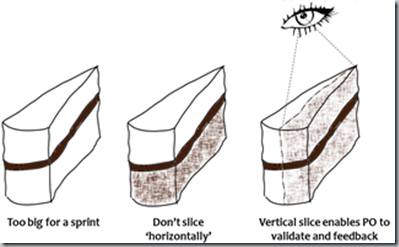 Slices should be end-to-end, going through each layer of the cake. Risk reduction: Avoid building the low value features which will probably never be used. Save the money – twice - firstly to build it and secondly to maintain it, for ever. Risk reduction: By properly finishing work as we go along, like a good chef, we aren’t left with a huge amount of un-estimate-able testing (washing up) at the end. This significant unknown (unknowable!) risk of back-end testing is almost eliminated with good engineering practices. Allowing companies like Flickr to deploy to live many times a day. Note: Whilst you _could_ start with a contracted document – a far better place is a user story workshop, with actual users writing stories onto cards. These are much quicker, more energised and almost certainly generate a better set of requirements to start the project with. There are many other ways in which Agile reduces risk – this blog has only looked at a few of the upstream contracting elements. Whilst this recipe won’t guarantee a good experience, hopefully it illustrates how the contractually minded a new perspective on risk management in software development. The delivery pipeline is an idea which resonates with our clients. The simplicity of the metaphor and the truths that it reveals make it a compelling message to share with others in the organisation. The overall organisational aim is to balance the pipeline, as any constrictions generate waste. The pipeline helps with the key challenge of getting senior stakeholders to prioritise and budget the money, and time, to balance the pipeline end-to-end. Instinctively, because developers create functionality then, if we want more functionality, we must need more developers. Whilst jarringly simplistic, this is a perspective held by too many senior stakeholders. However, adding more developers or teams, immediately leads to an imbalance in the capacity of each section. More development teams develop more code, which we then try to force through the lower environments – where it sits, wastefully, in queues or trying to muscle its way past other projects waiting for a limited slot in a integration test environment. In addition to the waste, the quality plummets due to the stress of trying to get work through this constriction. A situation that is often made worse when these downstream environments are shared with other projects / programmes. Similar constraints usually exist upstream of the developers. The Product Owner role is new to most businesses and the level of on-going work they need to do is often underestimated. Beyond the responsibility for preparing stories every sprint, collaborating with the team on a daily basis, POs need to actively engage with stakeholders and users. The diagram below illustrates the actual capacity of the pipeline, which can be quite an attention grabber. It’s troubling for senior stakeholders to realise they are paying for all that under-utilised development capacity. Use the pipeline diagram to communicate the essence of the challenge. These issues are difficult for even IT people to see and understand, even though they live with the stress of these systemic shortcomings on a daily basis. Create a sense of urgency by providing estimates of how much this waste is costing, both in money and in delayed value to customers. Improve the quality and frequency of collaboration across traditional organisational boundaries, e.g. between developers, service introduction, support and infrastructure. Improve ways of working upstream between Product Owners, stakeholders and the teams. A clear vision with stable portfolio backlog is more likely to create a steady flow of high priority work into the development teams. The teams themselves can improve quality and throughput by adopting Agile/XP technical practices and working more closely with both the product owners and the ‘downstream’ teams. Visualisation and quantifying of the waste is key to building a sense of urgency for change and then targeting interventions at the most wasteful sections of the pipeline. Real-time visualisation of queues is best done with Kanban techniques, which can highlight emerging issues in the system. The level of investment needed in environments and tools are often new to a business, which may not be clear on the sizeable returns available. These returns are often in the form of reduced waste, which many senior stakeholders can’t see or evaluate – even though they can sense waste all around. A senior director estimated that 50% of their software development expense was wasted. How have we ended up accepting, or not able to deal with, this level of waste? A smoother flowing pipeline also reduces cycle time, meaning that profit-generating functionality is deployed sooner. Whilst getting the budget is difficult enough, ensuring the work actually gets done, month after month, is even harder, given the prevailing culture in many businesses. Businesses and managers are rewarded for delivering value to customers. Few businesses reward managers for improving the capability of their system to deliver value. It’s common to recognise the sacrifice in fixing problems – rather than rewarding those who prevented the problems in the first place. The ‘non-functional’ work needed to improve system capability is difficult to value and prioritise in any company-wide backlog of work. Those that understand the potential benefits of a balanced pipeline need to articulate that value and be prepared to be held accountable for delivering the promised benefits. This cultural bias, towards delivery and not improving the means to deliver, continually sabotages attempts to balance the pipeline. The value stream maps highlight that many constrictions occur at existing boundaries within the organisation. The delay, hand-offs, lack of visibility and accountability at those boundaries are the biggest challenge to creating a balanced pipe. These changes to what people do, how they work with others, changes to accountability and their daily work will generate resistance. Specific action is the best way to ignite the change. People on both sides of the boundary typically suffer from its existence and are often keen to improve the situation. And… it’s not just the pipeline… but the shape of what you put down it.. In addition to working on the pipe itself – the throughput will be significantly improved by looking at the material going through it. This is the subject of a follow-up blog, where we’ll look at batch size, variance and work-in-progress as key variables.